Among broad-access colleges and universities, promising efforts to increase graduation rates and reduce opportunity gaps are emphasizing campuswide, systemic reforms—a national research finding that appears to be resonating on many campuses of The California State University (CSU). 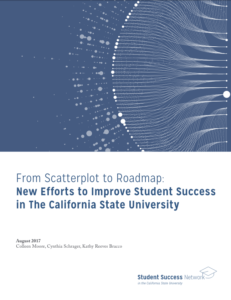 In a study exploring student success initiatives at the 23 campuses of the CSU, researchers at the Education Insights Center (EdInsights) detected a shift in planning at some institutions toward broader campuswide changes—not just discrete program adjustments or implementations—to address institutional barriers that can impede student progress. As one campus administrator said, “The really important goal would be to pull together all of these activities and really have a roadmap…[an] intentional plan as opposed to this kind of scatterplot of activities.” This finding is the result of a review of strategic and planning documents associated with student success efforts at all CSU campuses and an analysis of interviews conducted at four of them. This report aims to provide campus and system leaders with a scan of the current state of reform within the CSU, together with contextual insight into the obstacles and possibilities for broader scale adoption of coordinated, systemic change.